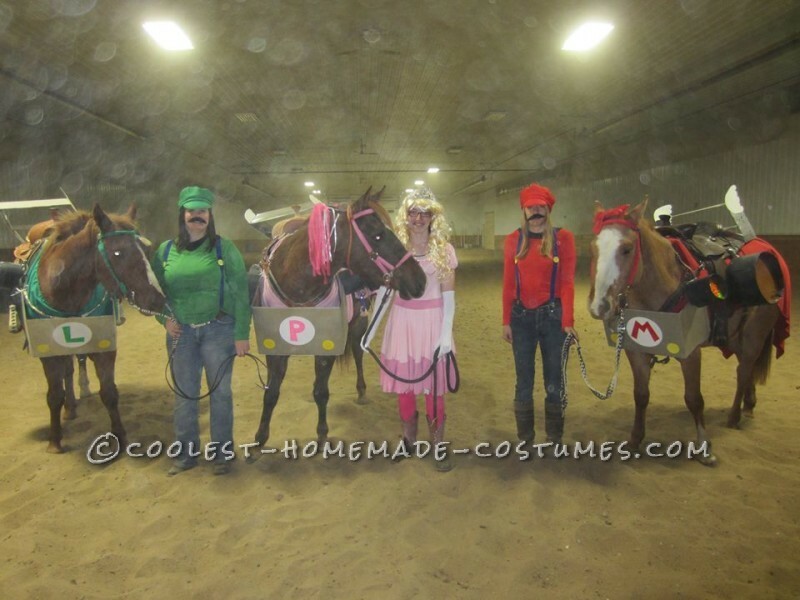 We wanted to dress our horses up for Halloween and had a couple individual costume ideas floating around, but one day I was browsing facebook and a friend had taken a “What should you be for halloween?” quiz, out of boredom I took it too and my result was “Mario Kart” with a photo of a group of people on bikes, I immediately thought we could do this with the horses easily!! So that started the brain storming and it took off from there. For our human costumes I ran to Value Village and found a green and red long sleeve shirt and grabbed the “Mario and Luigi Costume Packs” that had the hats, suspenders and moustaches, the Princess Peach costume came as a set and I bought the wig from Wal-Mart. 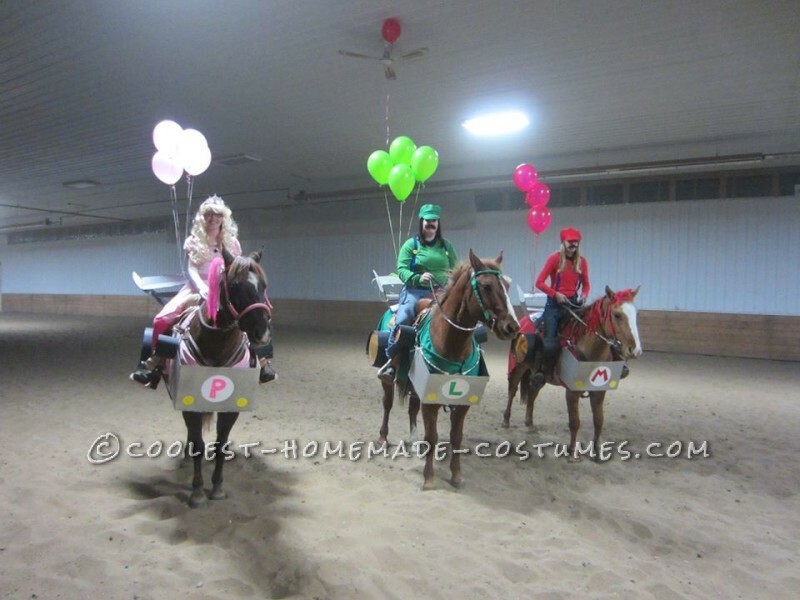 For the horses I found red, green and pink sheets at Value Village, we folded, cut, and sewed so they formed around their necks and velco-ed the front closure on their chests. The rest was cardboard and paper! The front bumpers were cardboard boxes that we cut up and spray painted silver, cut out some white paper and coloured on the logos and headlights, the wheels were strips of cardboard rolled up around a circle of cardboard with shiny paper glued/stapled to it, and the spoilers on the back were also cut up spray painted cardboard boxes with tabs that we duct taped on and stuck under the saddles to hold them on, the cloud shapes on the spoilers were just construction paper glued on. We also vet wrapped our headstalls to match and tied ribbons in their manes.